As with every Federal Open Market Committee (FOMC) statement day, there is a model for the stock market to follow pre and post announcement. Certain environments have very strong tendencies while others do not. Six meetings ago was one of the rare times where the models strongly called for a rally on statement day which was correct as well as a decline a few days later which was also correct. Today, as with most statement days, the first model calls for stocks to return plus or minus 0.50% until 2:00 PM. There is a 90% chance that occurs. The next model calls for stocks to close higher today and rally after 2:00 PM. That is usually a very strong trend, 75%+, however with the bulls using a lot of energy over the past few weeks, that trend’s power has been muted significantly to less than 50%. That’s not exactly the kind of trend worth trading. Finally, there may be a trend setting up for a post statement day decline, but there are a number of factors that still need to line up. Janet Yellen and her friends at the Fed have done an excellent job of preparing the markets for interest rate hikes this year. There haven’t been any surprises on that front. Recently, they have been chatting up a storm regarding a plan to reduce the size of the Fed’s $4 trillion plus balance sheet. You can expect to hear a little more about this in their statement today after they leave rates unchanged. With the Fed’s annual Jackson Hole retreat about a month away, Yellen and Company should continue to prepare the markets for a formal announcement in six weeks with lots of information released at Jackson Hole. Turning to a chart I continue to show time and time again, below is a long-term chart of the velocity of money (M2V) produced by the St. Louis Fed. In the easiest terms, M2V measures how many times one unit of currency is turned over a period of time in the economy. As you can see, it’s been in a bear market since 1998 which just so happens to be the year where the Internet starting becoming a real force in the economy. Although it did uptick during the housing boom as rates went up, it turned out to be just a bounce before the collapse continued right to the present. This single chart definitely speaks to some structural problems in the financial system. Money is not getting turned over and desperately needs to. It would be interesting to see the impact if the Fed stopped paying banks for keeping reserves with the Fed. That could presumably force money out from the Fed and into loans or other performing assets. Everything happened as expected on Wednesday. Stocks stayed in a tight range until 2PM. The Fed raised rates. Yellen spoke about reducing the balance sheet. And the bullish Fed trend was significantly muted. Given how stocks closed, there is a very short-term trend which indicates lower prices today and possibly into next week. However, with the stock market set to open lower, the opportunity to take advantage is likely gone. The Dow is now the leading index and that’s not the index which typically leads in the healthiest of markets. I don’t expect this to continue. Mid caps have really started stepping up with small caps not looking as dead as they did a short time ago. The NASDAQ 100, on the other hand, looks like it has more downside ahead with some sideways movement coming after that. As I always say, it’s not what the news actually is, but rather how stocks react. On Fed day, we saw good behavior from industrials, healthcare, home builders, banks, staples, discretionary, REITs and utilities. Read that sentence again. For the most part, those are not the same leaders as we have seen. Rather than the rally ending, it looks like it’s morphing after two “shock” days (big down days out of nowhere) in tech over the past month. 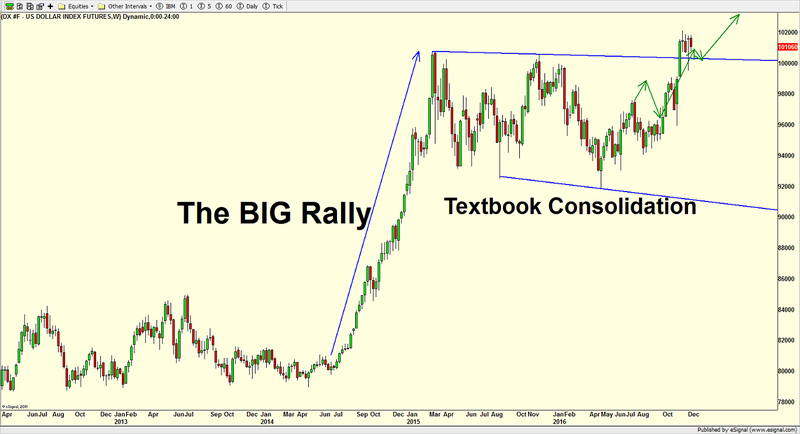 Now, tech may be done leading for a while, but it doesn’t look like the rally is over. Sure, we could see a pullback, but that would be yet another buying opportunity in a long line of successful opportunities. As with every Federal Open Market Committee (FOMC) statement day, there is a model for the stock market to follow pre and post announcement. Certain environments have very strong tendencies while others do not. Five meetings ago was one of the rare times where the models strongly called for a rally on statement day which was correct as well as a decline a few days later which was also correct. Today, as with most statement days, the first model calls for stocks to return plus or minus 0.50% until 2:00 PM. There is a 90% chance that occurs. The next model calls for stocks to close higher today and rally after 2:00 PM. That is usually a very strong trend, 75%, however with the bulls using a lot of energy over the past few days, that trend’s power has been muted significantly. It’s also June option expiration week which has historically added a nice tailwind to stocks. So far, that tailwind has been seen just on Tuesday. Janet Yellen and her friends at the Fed have done an excellent job of preparing the markets for another rate hike today. They have been chatting up a storm in their speeches and it’s also Yellen’s quarterly news conference and economic outlook update. I would be shocked if more than Neel Kashkari dissented. The flaw in my thinking is that I did not believe a change in the balance sheet would be a 2017 event. We will likely hear otherwise from Janet Yellen today. Markets are expecting to learn of a plan outline to begin to curb asset purchases by the Fed sooner than later. That should eventually lead to letting assets organically roll off the balance sheet rather than outright sales in the open market. The markets would be very surprised and caught off guard if Yellen speaks about a plan to sell bonds in the open market any time soon. I would say that today’s move has a 95%+ certainty. The Fed is going to raise the Federal Funds Rate today by .25%. Banks will then raise the prime lending rate and other rates will move off that. While the economy continues to improve, Q1 GDP was less than stellar although recently revised higher. My own work suggests that Q2 could see GDP grow close to 3% with Q3 perhaps even higher. Monthly job creation has been very strong in four of the past five months. Only March was a lemon. I expect the growth trend to continue. The official unemployment rate hasn’t been lower since 2001 and the “real” rate or U6 is down to 8.4%, the lowest since 2007. This data certainly support a hike. The chink in the armor and what Neel Kashkari may cite if he votes against the hike is the recent decline in inflation. From a 5 year high of 2.7% in February, the consumer price index declined in March, April and May to 1.9%. That is exactly what the Fed does not want to see as it tries to normalize interest rates. Continuing to raise rates, as I have written about over and over, also makes our currency a lot more attractive to foreigners. Remember, money flows where it’s treated best. Since early 2008 here, in www.investfortomorrowblog.com and on the various financial channels, I have been a devout secular bull for the dollar, even when trillions were being manufactured by the Fed. For years, I sat alone in my bullish house before having company over the past few years. As I have written about, I truly believe that one of the main reasons Yellen and her inner circle worry about raising rates is because they are terrified of massive capital flows into the U.S. as the dollar index breaks out above par (100) which is already did and travels to 110, 120 and possibly higher, somewhat like tech stocks did during the Dotcom boom. Below is a chart I continue to show at each FOMC meeting. While Dollar Index bounced around between the blue lines after that huge rally on the left side of the chart, all was very well and that was normal and expected behavior. 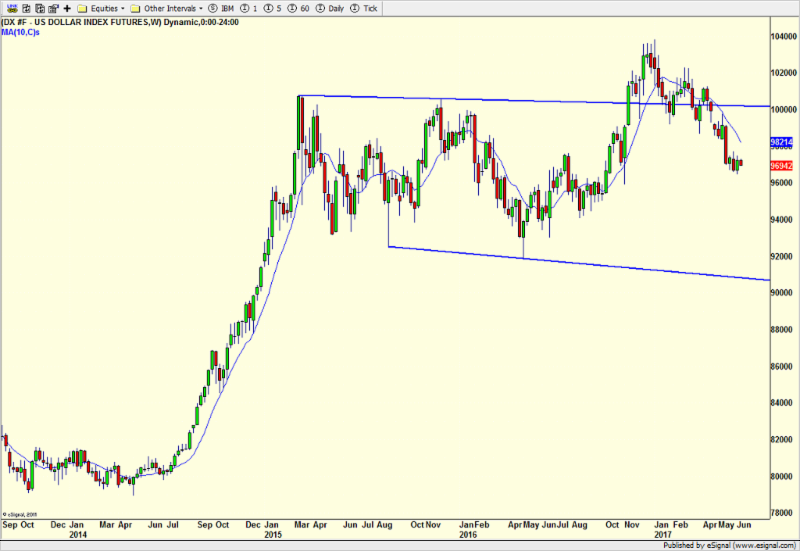 When price broke above the blue line late last year, I thought the next big move had started. I was clearly and definitely wrong. In the strongest bull markets, price should not have declined much below 100. This has been an unexpected turn for the worse. However, I am not ready nor close to being ready to abandon my long-term positive position. If my view is going to continue to pan out, the dollar will likely spend some time going sideways before gathering itself for a run to 104 and then much higher in 2018 and 2019. I still forecast that the final bull market price peak lies ahead and at least towards the 120 level. Nothing has changed in my long-term view that the Euro will ultimately fall to all-time lows below .80 and the Pound under par. Those are the same long-term targets from 2008. A soaring dollar would be great in the short-term for all except those who export goods. Our standard of living would go up. Companies with U.S.-centric businesses would thrive. Foreigners would buy dollars in staggering amounts at a dizzying pace which I argue would make their way into large and mega cap U.S. stocks. Think Dow 23,000 (my most recent target), 25,000 and possibly 30,000. Eventually too much of a good thing becomes problematic. In this case, mass dislocations in the global markets would grow and that would almost certainly lead to a major global financial crisis later this decade. Think many elephants trying to squeeze out of a room at the same time. Think crash of 1987 on steroids. Yellen and the other smart people in the room must know this. You may not agree with their thinking and actions, but some of these people are scary smart. As with every Federal Open Market Committee (FOMC) statement day, there is a model for the stock market to follow pre and post announcement. Certain environments have very strong tendencies while others do not. Two meetings ago was one of the rare times where the models strongly called for a rally on statement which was correct as well as a decline a few days later which was also correct. Today, the upside edge is just outside a coin flip and certainly not worth playing based solely on this. While it’s also December option expiration week which has historically added a nice tailwind to stocks, that edge has also been a bit muted by the strength seen on Monday and Tuesday. On the bright side, there could be a strong and playable short-term trend to the downside starting by the end of the week, but we will have to see how the next few days play out. Janey Yellen and her friends at the Fed have done an excellent job of preparing the markets for a rate hike today. I would say that it’s a 95% certainty. The Fed is going to raise the Federal Funds Rate today by .25%. Whether you want to attribute it to the Fed making an independent decision based on the economic data at hand or that Donald Trump’s agenda is assumed to be very pro-growth or that Paul Ryan will be running tax policy or even that stocks have become a bit frothy, short-term rates are going up today and next year. Looking at what the Fed is supposed to be basing their decision, the economy, we see a mixed bag. Over the past three months, we have created 156,000, 161,000 and 178,000 jobs in the U.S which seems pretty good on the surface. However, that’s 200,000 less jobs than 12 months earlier. The manipulated unemployment rate is down to 4.6% with the real or U6 rate at 9.7%. And while the consumer price index (CPI) has finally started to uptick after percolating for years, it’s hardly hot and worrisome. Our economic output, GDP, is improving and now stands at just over 3% which is also finally good news. I fully expect that to click between 3% and 4% in 2017. 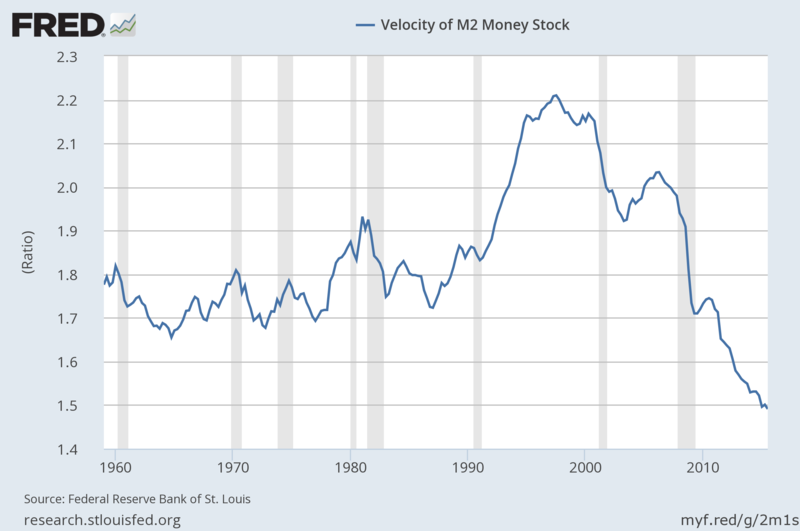 Turning to an oldie but a goodie, below is very long-term chart of the velocity of money (M2V) produced by the St. Louis Fed. In the easiest terms, M2V measures how many times one unit of currency is turned over a period of time in the economy. As you can see, it’s been in a bear market since 1998 which just so happens to be the year where the Internet starting becoming a real force in the economy. Although it did uptick during the housing boom as rates went up, it turned out to be just a bounce before the collapse continued right to the present. Continuing to raise rates, as I have written about over and over, also makes our currency a lot more attractive to foreigners. Remember, money flows where it’s treated best. Since early 2008 here, in Street$marts and on the various financial channels, I have been a devout secular bull for the dollar, even when trillions were being manufactured by the Fed. For years, I sat alone in my bullish house before having company over the past few years. As I have written about, I truly believe that one of the main reasons Yellen and her inner circle don’t want to raise rates is because they are terrified of massive capital flows into the U.S. as the dollar index breaks out above par (100) which is already did and travels to 110, 120 and possibly higher, somewhat like tech stocks did during the Dotcom boom. Below is a chart I continue to show at each FOMC meeting. 120 is the next long-term target. A soaring dollar would be great in the short-term for all except those who export goods. Our standard of living would go up. Companies with U.S. centric businesses would thrive. Foreigners would buy dollars in staggering amounts at a dizzying pace which I argue would make their way into large and mega cap U.S. stocks. Think Dow 23,000, 25,000 and possibly 30,000. I understand why the Fed is going to raise rates. I truly do. However, given our current mixed economic picture and the weakness, deflation and accommodative stances of central banks elsewhere, I believe that Yellen and her minions are barking up the wrong tree.